I signed up for a free floral decorating class to learn how to incorporate a little nature into my home. I'm an avid Nate Berkus fan, and he's always telling viewers to add elements of nature to their home decor. Tonight's lesson was moss covered letters. 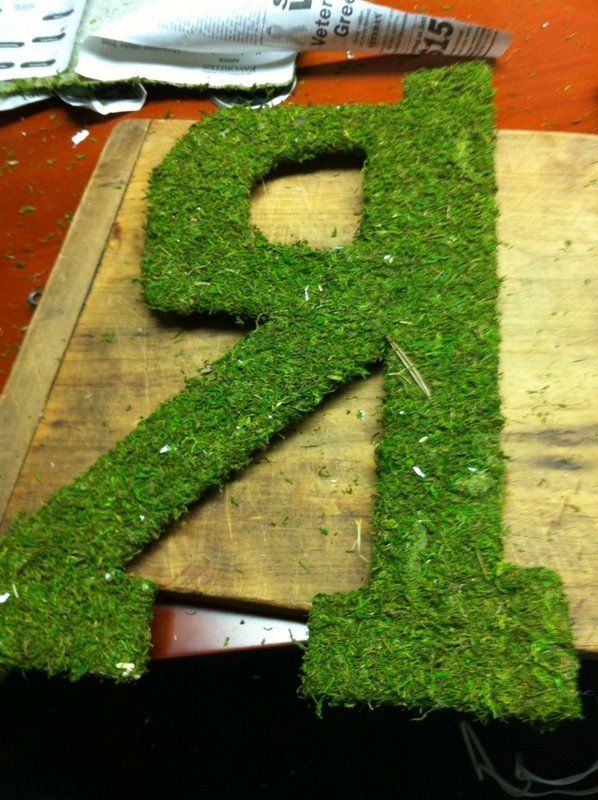 Our instructor held up what was to be our inspiration - a picture moss-covered letters sold by Pottery Barn for $80 each. She then showed us the one she made for only $10! I was so stoked and decided it would make a fabulous Do-It-Youself (DIY) blog entry. I love home decor blogs and am astonished by all of the DIY projects. I, myself, am not so handy with a glue gun, but I thought this would be such an easy project to share. So it began. I will maintain that the letter R (for my last name, Rumbach) is the most difficult of the alphabet to cover with moss. Nope - no arguments - R is the hardest - end of story. I watched my classmates whip up their Os and Ts with ease while I wrestled around all of Rs curves with my exacto knife. "You're fighting the knife," my instructor said. "Let it do the work for you." "Will you do the work for me?" I joked. Not so sure she thought I was funny. This moss stuff was serious business, so I got to work. I cut, I glued, I measured all the while taking pictures so I could instruct you, dear blog readers, on how to stick it to Pottery Barn with your very own mossy initial. Once I had all of the moss secured on the back - I was really nervous and excited to turn it over to see how it had turned out. I flipped it over and knew immediately something didnt look quite right. It took me a second or two - then it hit me. Yeah, it's backwards. The Pottery Barn spirits are howling with laughter. So, I suppose this might not be the blog to find DIY projects. Just stop on by here for the fat jokes.